Finbarr started it with the idea of a Sandycove three-lap invitational race at the end of October. With two weeks to go and no mention, Carol Cashell and I raised the idea again and discussion ensued. With less than a week to go the starting lineup was small. The forecast for the weekend showed the Irish south-coast would catch the spin-off of storm Saint Jude. (I know, I’ve never heard a storm called after a Saint either). Winds were forecast to be Beaufort Five minimum. Excellent! A bit of rough water was ideal to level the field. After all the Sandycove locals have it too easy at times, when the weather blows out they just start swimming inside the island. Pfft. The worse the forecast the better, as far as Carol and I were concerned. Although as the fastest of the group, it wasn’t like she needed an advantage. By Thursday the weather forecasters were all getting excited like we don’t have big storms every year. Jude would bypass Ireland and clobber the UK, and Ireland would be assailed by nothing worse than Force Nine or so. The worst of Saturday’s weather was due to hit before mid-day when the worst of the storm would arrive on the south coast. We were aiming for TITW at 11.30am. Cake to be proved afterwards by Carol. Finbarr was allowed to drown anyone foolish enough to get within an arm length of him (a rule on which he insisted, disguising it as English Channel Rules). Despite beating Rob and Craig this year, I was due to get an excellent three-minute handicap over both of them, which i didn’t refuse. All’s fair. Rob Bohane is a member of the “M” 1000+ lap club, as is Finbarr and Craig Morrison is a member of the “D” 500+ lap club,. Eddie Irwin, Carol Cashell and myself are all “C” swimmers of 100+ laps. All highly experienced marathon swimmers with many and varied skills. 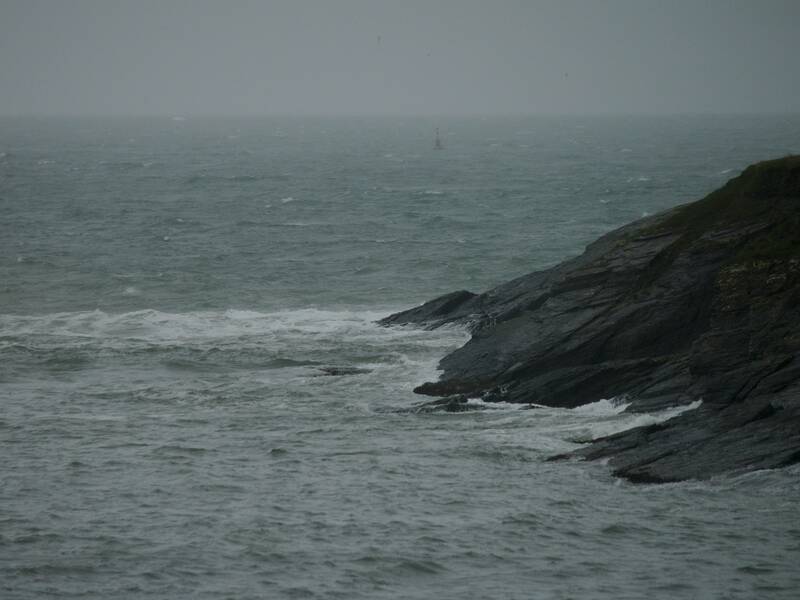 The local forecast for Sandycove showed winds peaking between 10am and 1pm, anywhere from Force 6 to Force 8. Second Corner to third corner, buoy in the distance. The second corner looked quite reasonable when I arrived, though the rain meant I could only take one quick shot. The wind was still rising. Down at the slipway, another M club member (1000+), Mags Buckley (no relation) said the water was lovely and warm but she’d stayed to the inside. From the slipway we could see the waves breaking across the first corner, and the outside wave that only breaks when winds are getting high, reaching into the corner. The expert round beside the first corner was impossible. The normal route outside first corner was impossible. Even the cowardly route outside the normal first corner was … (f)risky. I like (f)risky. At the last minute, the handicap and race was thrown out. Then the five others started swimming just as I was on the slipway. The water was indeed warm, an extraordinary for end of October fourteen degrees (57F). Just getting to the outside was testing. The narrow point between the island and mainland produced an unpredictable wall to swim through, which ripped my goggles off. Going over the top resulted in a crash into the trough. Unlike a breaking wave, it wasn’t predictable. Meanwhile waves were peeling off the corner rocks where the expert Sandycovers normally cut inward. The first corner was froth but all the guys were waiting beside the outside break. I took a slightly inside line, watching for the rock that is only exposed to air in conditions like this, having seen it once last year from above in similar conditions, and therefore having its location well imprinted. I stopped to fix my goggles a second time, something that was to continue for the whole swim as they were constantly loosened by the waves. Then we were all off again. The waves were about three metres, not at all unusual for a Tramore Bay swimmer, and in the “lumpy” category. But outside the island, things change. 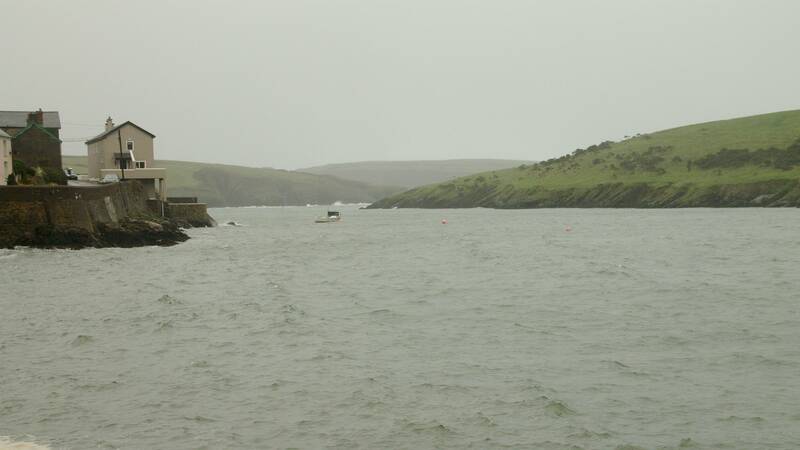 Apart from being in the direct path of the south-west wind coming over the Old Head of Kinsale, some wind was diverted at water level along the side of the coast. Waves climbed out of deeper water onto the island shelf to produce one of the most unpredictable of water states, that of reflected waves over rock. First corner. Note the outside wave, which had grown by the time we started. The waves hit the island and bounced back, doubling up with incoming waves at different times and places, causing sudden occasional peaks of four to five metres or shelving waves to scend suddenly, like a punch of water. The 360 degree horizon was mere metres away for everyone, all of us sunken into watery bowls, except for the island’s grassy profile, the wind and rain and spume filling the air, grace in the water impossible even for a swimmer of Carol’s style. It was excellent fun, that feeling of being hurled and thrown by an ocean that would be terrifying for beginners but feels like an opportunity to revel for a more experienced swimmer. One moment we were two or three metres apart, the next we were thrown onto each other. I picked up a scrape, not from rocks, but from Rob being thrown onto me fingernails first. The second corner is where expert Sandycovers risk the limit. The interface of gradually descending reef and pushing swell. How close? How much risk can you take? We love the second corner. Approaching out of the kidney bean shape, you can be too close or too far out, and even if you get a great line, you still have others to deal with. Others who put you on the reef, or risk the reef themselves, and laugh. People like Finbarr, Craig, Rob, or me. The second corner is a melee, a game of chicken played not with other swimmers but with rock. Unthinking, unmoving and therefore always triumphant rock. But not that day. The second corner was instead a marine Jackson Pollock, the reef as canvas, the sea as paint, the wind as artist. From outside we could only see the precipice of the artichokey-feldgrau waves as they crashed onto the corner. We all went wide, to a greater or lesser extent. Carol and I cut in a little as we passed the first two hundred and seventy degrees of turn, catching a wave to pass the trailing end of the reef. We stopped again to regroup. Past the second corner is a favourite spot of Sandycove swimmers, inside the mush, behind the reef, where if you are not racing, you can stop and chat, before you race back anyway. Assembled again we all re-started, as I grabbed the positional advantage. The visibility decreasing as the wind of the leeward side funneled around the low third corner. Then around into the inside. Sheltered from the outside storm, the visibility, already poor, actually decreased. The wind poured up the inside, driving rain and chop head-on. The Red House (now grey) took ages to pass swimming against the wind. Eddie passed on my left. Carol passed me on the right, their better strokes more advantageous in the lesser size of these conditions. Was I middle of the Channel or left of right? I couldn’t see. The water here lacked any visibility also. Any one stupid enough to be on a boat in the channel on the day better be keeping an eye out for the even-more-stupid swimmers. Past the Red House eventually, the forward chop constantly slapping me in the face. Stay low. Get under it. I know where the slipway should be, but instead I swing left. The fourth corner seems miles away on my left. It’s an island though so I can’t get lost. Had to line up for the first corner again. From this angle you normally approach really close in. 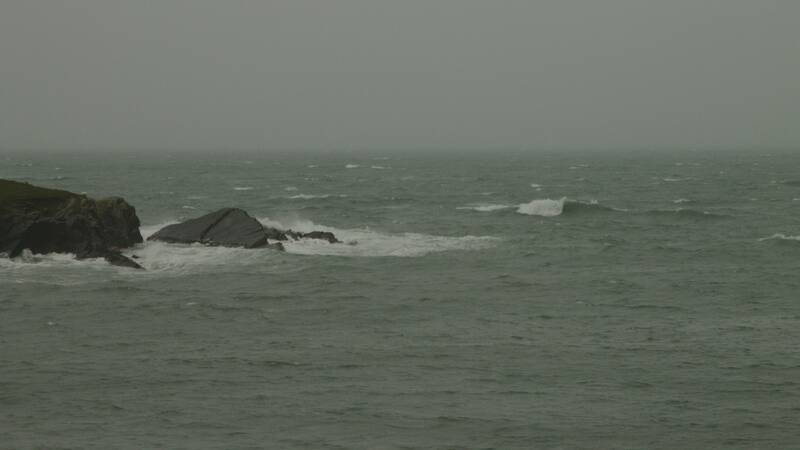 But there are rocks beside the island between fourth and first so outward, back through the middle of the gap, once again getting hit by the waves of the narrow point. Further out this time, the waves looked bigger. Outside the corner, finally out of the head-on rain, I stopped and looked around. No sign of the others. Ha! 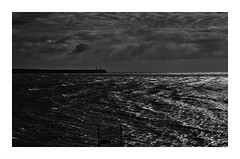 Loneswimmer alone again. No further waiting I set off again, enjoying the outside once more, watching for the pure white water indicative of a sub-surface reef, watching for square waves within two metres of me, sliding along the faces of the sudden peaks to surf in and swim back out, tacking and gibing my way around the island, going wider around the second and third corners to enter the inside channel again, and to cruise back to the slipway, the driving rain dropping but the water visibility still being impenetrable, until I crashed into the slipway, the other five already changed having only completed one lap each. Default winner of the race that wasn’t! Didn’t even bother towelling dry in the rain. Cakes and buns from Carol and Maura Morrison. Thirty minutes later the wind had almost died, the rain was gone, and the water settled. We had got the timing exactly right. By accident. I once suggested Mike Harris’s “It’s a bit lumpy, chaps” could the club motto, and this day was the epitome of that attitude. Rough water is fun (once you know you don’t have to swim through it for the next twelve hours). Sandycove C, D & M clubs. Sounds like a complete blast! My short swims to a buoy 1/2 mile off a SoCal beach may as well be in a pool (except for the lack for chlorine).